I've got two cards to share with you, come and see: It's Saturday and a new challenge over at Less is More and this week it's a technique. For our theme this week we have a technique for you to try. It may be new to some of you, so just in case here is a brief set of instructions. Stamp the solid stamp onto the card! I used a stamp and die set that were a magazine freebie a couple of years ago. I stamped the solid feather in pink and kissed it with the feathery feather in dark blue,stamped it twice and cut them out with the die. 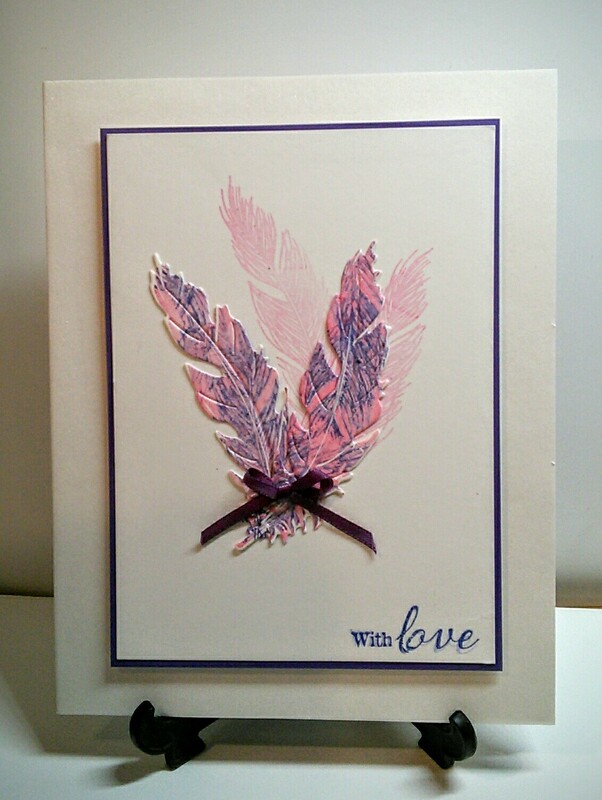 I stamped the feather in pink on the card and added the diecuts with a little ribbon bow which IRL matched perfectly!!! The sentiment was part of the set which is all from Hot off the Press. I drew a grid and used alcohol pens to colour in. I stamped and embossed a bauble on the waste and diecut it and popped it in the middle. I also diecut a Creative Dies sentiment and used bits from a Sizzex pine branch on the corners. Two fabulous card Valerie. I love the technique and design with the feathers. I love how you stamped your feathers, Val and your Christmas card is adorable. Both great cards, love the feathers. You have been so creative with the plaid - well done you! Hi Val - two great cards. 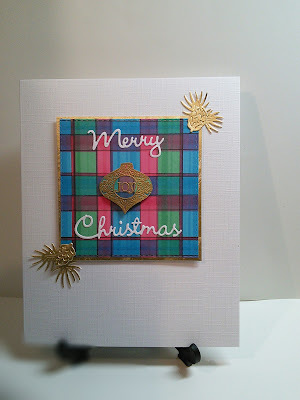 Love the feathery feathers card and well done on making your own plaid; beautifully lined up. What a beautiful feathery card, so pretty! Great xmas card too! your LIM card is beautiful, val... love the soft feathers!! love the plaid you created for your merry monday card!! Came to see your lovely, non-traditional Christmas card (which is awesome, by the way) then saw the feather card...let's just say, I'm delighted I dropped by. Wouldn't want to miss either one of these. 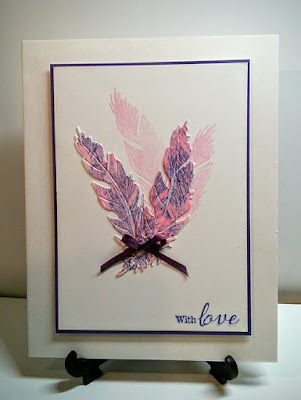 Your kissed feathers are so pretty Val ... great colours and I love the idea of the stamped images in the background with the kissed die-cuts in front. Great design. Gorgeous cards Val and such elegant and classy kissing on the first one. I love your kissed feathers Val, they look awesome! Gorgeous effect with your kissed feathers.